Seckford Hall, set amid gardens and woodlands, is without doubt one of England’s most beautiful Tudor houses. Grade-II* listed and largely dating from the mid 16th century, the house is awash with Tudor splendour. Indeed, it was in what is today known as The Great Hall that Elizabeth I is said to have held court. A second piece of information of interest to the history enthusiast is that the chair in which Edward VII was said to have died is kept here. Boasting over 30 rooms divided between the main house and converted stables (The Courtyard Rooms), Seckford Hall also features an indoor swimming pool and wellness centre. 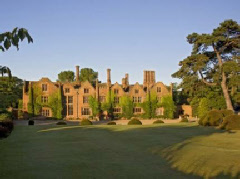 Located just to the west of Woodbridge, Seckford Hall is within easy reach of Ipswich and Felixstowe.